The Handy Dandy Hand Strap keeps your camera snug and secure in the palm of your hand, and unlike a traditional strap, it won’t put any weight on your neck or shoulders. The best part? Your finger will always be right next to the shutter, never miss the perfect shot again! This must-have camera hand strap is available from Photojojo from $40. Hello! 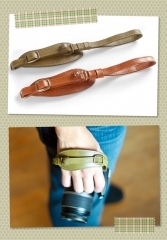 Just found your site while searching for reviews of this strap. Did you end up getting one? If so, do you like it? Hi Steph – unfortunately I didn’t get one. I shoot with a Canon 5D MkII and I think the camera will be too heavy for the hand strap. I think with a smaller camera it will be an absolute treat!